You won’t find more user-friendly, easy to maintain sliding windows than those produced by Renewal by Andersen. St. Louis homeowners and homeowners throughout the United States deserve a sliding window that won’t stick in or lift from its track every time it is opened and closed, and that is precisely what Renewal by Andersen has produced. Using durable, high strength Fibrex frames Renewal by Andersen crafts sliding windows that require little maintenance and glide open and closed with little effort. Like all Renewal by Andersen windows, our sliding windows are made weatherproof by an advanced sealant. While other sliding windows may allow high winds or rain to penetrate through, Renewal by Andersen sliding windows st and up to even the harshest weather conditions. And thanks to the durability of Fibrex, they will function properly for the full extent of their lifespan. If you are a homeowner who experienced poorly functioning sliding windows, it is underst andable that you may be wary of replacing those windows with other sliding window. If you feel this way, we encourage you to visit our St. Louis showroom and test out Renewal by Andersen sliding windows. You will see the difference that higher quality materials and more advanced design make. 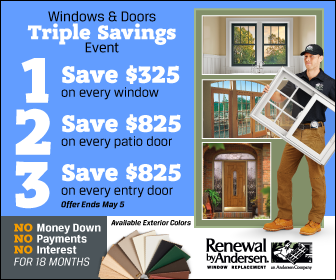 When you do turn to Renewal by Andersen of St. Louis for sliding windows, your new windows will be backed by Renewal’s industry-leading warranties. For full details on these warranties, visit our Window Warranties page.